Have you ever thought, “gee whiz, I really wish I could talk to my light switch…”? Well, you’re in luck, smart thermostat maker ecobee just released a Wi-Fi smart switch with Amazon’s Alexa onboard called the Switch Plus! 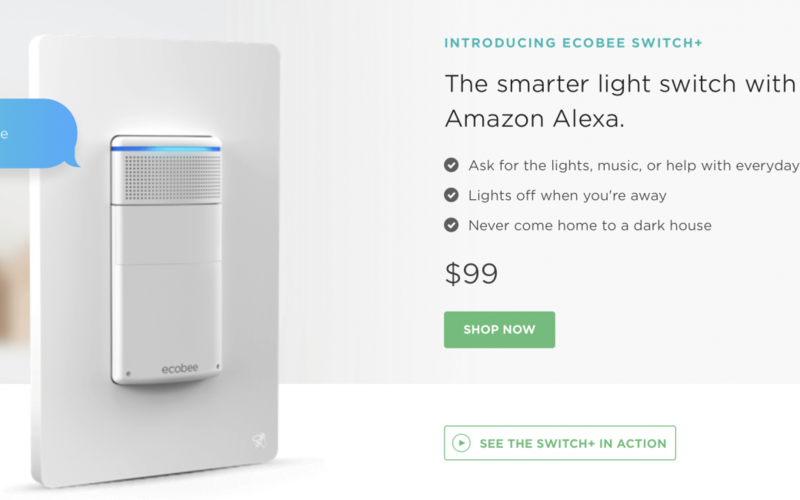 Now, ecobee isn’t completely new to this “add Alexa to a wall-mounted smart home device” game. In 2017, they introduced their latest generation thermostat, the ecobee4, also with Alexa integrated right on the device with far-field listening microphones and a speaker. A talking thermostat? Yup. But seriously, there is definitely something to having a multi-function voice assistant device mounted at a convenient location on the wall. Remember the intercoms of the 1970s and ‘80s? Merge that with the “Computer” of Star Trek and then fast-forward to today with Alexa and Google Assistant. One small problem with adding a voice assistant to (potentially) every room of the house is needing to find a place for a smart speaker or other device that has a voice assistant. And some rooms don’t need a great music listening experience, they would probably be perfectly fine with average sound quality and basic voice interaction. That’s where a smart switch with a voice assistant makes sense. OK, so what does this Switch+ thing do? It’s a remotely-controllable Wi-Fi smart switch. Doesn’t work for 3-way circuits. Does require a neutral wire. It doesn’t dim, but it works great with both regular lights and ceiling fans. It has a light, motion / occupancy sensor and a temperature sensor. The motion sensor can trigger the switch to turn on in a dark room, and automatically turn off the switch after no activity, too. And there’s a nightlight that can turn on when the room gets dark. HomeKit users gain direct access to the Switch+ sensors for creating automations. Coming summer 2018, the temperature sensor on the Switch+ will act as a remote sensor for ecobee thermostats, and there will also be a vacation mode feature available. The Switch+ works with a myriad of voice assistants and smart home systems, including Amazon’s Alexa, Apple’s HomeKit / Siri, Google Assistant, SmartThings, and IFTTT. There’s event an on-device voice-controlled maintenance menu for restarting and resetting the device. More convenient than flipping a breaker! While the Switch+ speaker didn’t provide boom-box level sound, I wasn’t expecting it to. It was nearly comparable in loudness to an Amazon Echo Dot, and the small speaker reproduced music that worked pretty well for general listening. I think podcasts would also be a good fit for the Switch Plus. On voice recognition, I tested it from several points and distances in my small home, including speaking loudly in the opposite directions of the mics, at a distance of about twenty feet away, and there was no issue with recognition. Overall, I think it’s a pretty good all-in-one smart home device and would recommend it to anyone wishing to start or grow their family of Alexa devices. Check my video for demos and additional information.